One way of challenging the status quo is to boost the number of men working in nurseries. Currently only two per cent of the early years workforce in the UK is male and 25 per cent of primary schools have no male staff. This means young boys are growing up in a highly feminised environment and Janice Savage who wrote the book ‘Brave Boys’ for the National Day Nurseries Association is concerned that in this female-dominated profession, practitioners may not be recognising and responding to boys’ interests and learning styles as readily as they respond to girls. David Wright, who runs Paint Pots Nurseries in Southampton, has created the Men in Early Years Charter. He has found that sometimes nurseries can have a ‘female’ décor just by the nature of them being staffed by women. This means “the colour, texture, layout and space usage of an area defines its gender” and the type of play that goes on there. Having more male nursery practitioners can benefit children of one parent families who may not have a male role model and just by being visible in a nursery setting, they can also encourage more fathers to engage with their children. Studies have shown gendered toys can shape how children play and what games they play. This is why children should be offered a wide range of toys as play is how they explore the world and make sense of what is around them. “Because gendered toys limit the range of skills and attributes that both boys and girls can explore through play, they may prevent children from developing their full range of interests, preferences, and future talents,” says Dr Elizabeth Sweet, a sociologist and lecturer at the University of California. Campaigner Olivia Dickinson of Let Toys Be Toys campaign, which have been doing their best to fight the gender stereotyping of toys, says: “Children should feel free to play with the toys that most interest them. Zero Tolerance, a Scottish charity working to end men’s violence against women, is keen to redress the balance and has sent tool kits into every nursery in Glasgow to raise awareness of how young girls and boys are treated differently from the day they are born. It suggests changing practice so girls are ‘allowed’ to be assertive without being labelled ‘bossy’ and boys are ‘allowed’ to get upset. Other words to be mindful of are ‘firefighters’ instead of ‘firemen’ and ‘police officers’ and instead of ‘policemen’. Children should be praised for what they do rather than how they look. Books are vital in helping children to question gender roles. Unfortunately, children’s books tend to have male central characters such as The Very Hungry Caterpillar and the Cat in the Hat sending the message that female characters are less important. Nurseries need to be aware of this and endeavour to offer children books featuring strong female characters as well as strong male characters. Parents can hugely influence how children think, especially in the early years, and can mock their sons for playing with dolls or dressing up in their sister’s clothes. 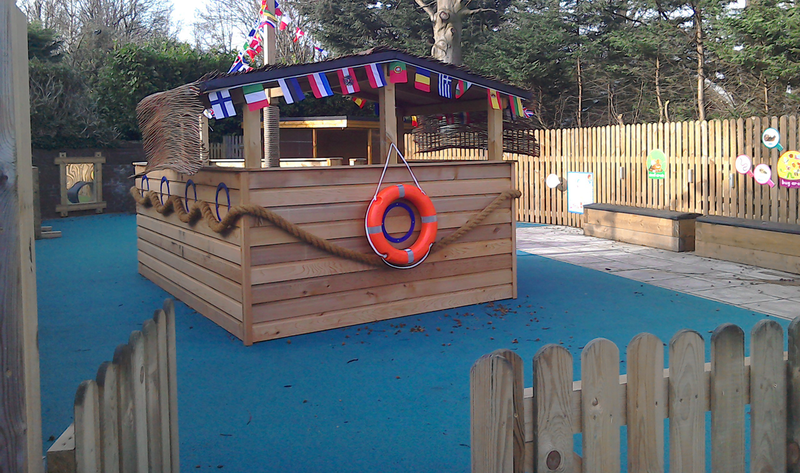 Nurseries can provide children with a safe space for them to dress how they wish and play with whatever toys they like. It is important that children are also challenged about any statements they may say. Practitioners at a Bright Horizons nursery were quick to intervene when a boy who wore pink shirts nearly every day was told by another boy more than once that “boys don’t wear pink”. With support from staff, the boy explained he was a big fan of the singer Bruno Mars who also regularly wears pink. Girls can enjoy playing with figures such as dinosaurs just as much as boys. However they are often not given the chance and nurseries play an important role in enabling them to do that. Bright Horizons held a Dinosaur Day and found parents of some of the girls had not thought of buying dinosaur toys or books for them and “were surprised at how popular they were”. By the age of five, there is already a gap in terms of development with boys lagging behind girls. Janice Savage who wrote NDNA’s ‘Brave Boys’ is concerned nurseries may not be ‘meeting the different ways in which boys learn as readily as we meet the girls’. The book points out there are essential biological differences between boys and girls which change the way they learn. The Hippocampus (the area of the brain that supports memory) is slower to develop in boys than in girls and therefore boys need reminding more often and won’t be able to retain a lot of instructions at once. Similarly the corpus callosum (the super highway which links the two halves of the brain) is smaller in boys and carries fewer connections between the right and left hemispheres of the brain. This is why boys may find it difficult to do two things at once. Boys also have more dopamine in their blood streams – a chemical that increases risk taking and experimentation behaviours. ‘Brave Boys’ claims the key to engaging boys is to keep them physically active and urges nurseries to think about the outdoor play they offer. Ways to engage boys include integrating outdoor activities into literacy, linking activities with superheroes, using arms and legs and clay to make letter shapes and acting out stories. Most importantly of all – it is crucial early years practitioners remember boys are not less able than girls, they just learn in a different way and they need to tap into this to ensure they harness their energy rather than contain it as the way they work with boys will affect their whole development in years to come. Data from the World Economic Forum last year, ranked the UK fifth in the world for income equality with British women earning 45 per cent less than men a year. This is despite females outperforming males from primary school up to university level. The gender pay gap is thought to be due to women being more likely to do part-time work and also tending to work in lower-paid professions and less likely to be in highly-paid senior roles. Unfortunately this inequality and mindset about what jobs boys and girls should aspire to can be embedded in the minds of children from an early age, if they are exposed to damaging stereotypes both at home and in nurseries. Early years settings should be doing their utmost to tackle this gender disparity and promote equality between the genders in the generations of the future. At our Liverpool Day Nursery we ensure that all of our kids have access to the widest range of modern equipment, books and dressing up clothes so they can use their imaginations to the fullest. Our outdoor play area is also accessible to the children all year round so they have the opportunity to explore the outdoors and play freely. If you are looking for an OFSTED approved day nursery that offers Free Grant Places, please contact us and we will be happy to answer any questions you may have.